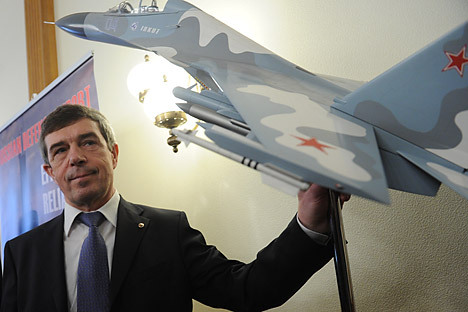 Anatoly Isaykin, director general of Russian arms exporter Rosoboronexport, spoke to Kommersant on the company’s performance in 2013 and its prospects this year. In 2013, Russia’s state arms exporter Rosoboronexport set a company record, exporting more than $13.2 billion in arms and military equipment. Company head Anatoly Isaykin talked about the company’s success and its plans for the future. Rosoboronexport has its preliminary 2013 performance results. What was the total value of last year's export deliveries? By December 31, we had delivered armament and military equipment worth $13.2 billion. This is slightly higher than the $13 billion we had planned for. Overall, from 2001 to 2013, Rosoboronexport's annual exports grew fourfold. In 2013 alone, we received and considered 1,902 requests from foreign customers and turned 1,202 of these into contracts. Did your sales geography change in any way last year? It did not change much: India, China, and Vietnam remained our primary customers. We also worked with Indonesia, Venezuela, Algeria, and - to an extent - with Malaysia. In all, we exported to 60 countries in 2013. Do you expect Rosoboronexport's revenue to grow significantly after the government clears new types of weapons for export? I don't believe our revenue can exceed $15 billion. We proceed from the appraisal of our own capabilities, and those of the Russian defence industry. External factors should also be taken into account, like the crises that have rocked Europe and the U.S. in the past seven or eight years. There is also instability in different regions of the world. We all see what is going on in the Middle East, what with the Syrian war, the embargo on arms sales to Iran, and the revolutions in Libya and Egypt – we had serious plans for all these countries. What types of Russian weapons have particularly good export prospects? What can Russia offer to the international arms market? Russia is prepared to offer everything it has, from firearms to anti-aircraft [missile] systems. We hold out certain export hopes for the Mil and Kamov helicopters, for the S-400 Triumf, Antey-2599, Buk-M2E and Tor-M2E SAM systems, for the Pantsir-S2 missile/artillery air defence system, and for the Igla-S man-portable anti-aircraft missile system. Our naval equipment is represented by the Project 11356 and Gepard-3.9 frigates, the Project 636 and Amur-1650 submarines, and the Svetlyak and Molniya patrol boats. Equipment for ground troops includes the upgraded T-90S tank, the BMP-3 infantry fighting vehicle and its derivatives, and the Tigr armoured vehicle. The Sukhoi Su-30 and Mikoyan MiG-29 fighters were very popular with foreign customers last year, and the Yakovlev Yak-130 combat trainer is a firm international success. Our customers are particularly interested in the Su-35 fighter as one of the most advanced warplane designs. How would you comment on Washington's decision to abandon plans for purchasing follow-up batches of Mil Mi-17V5 helicopters for the Afghan military? The decision only applies to future purchases. We are working to complete the current contract for 30 airframes. We have looked at different possibilities involving options for more such helicopters. Did we hope to land a follow-up contract? Yes, we did. However, things did not even proceed as far as the beginning of talks on the possibility of future deliveries. I would say that the U.S. Congress lobby representing the interests of the American defense industry in general, and of Sikorsky in particular, worked thoroughly and meticulously and finally achieved what they wanted. This is how we interpret this decision. The Afghan military needs our helicopters like air; they have been repeatedly asking us to sell, both in direct conversations and through the Pentagon. Helicopters are the only equipment fit for fighting drug trafficking and terrorism in Afghanistan's mountainous terrain. The U.S. military are well aware of that fact. They are quite familiar with this aircraft type, they can compare its performance and price with those of the available U.S. products; most importantly, they understand the conditions in which these helicopters will have to operate. Afghan military representatives have stated in no uncertain words, including in Congress, that the Mil helicopters are the best option for them. They are used to operating Russian equipment, they have enough specialists that can be trained to fly our helicopters and maintaining them. Incidentally, Afghan technical personnel are trained in Novosibirsk under a contract with the U.S. In other words, contrary to the U.S. military's attempts to prove otherwise, Afghanistan would have no problems maintaining these aircraft. The fate of Russian arms exports to Syria was the talk of the town in 2013. Part of the equipment required for the operation of S-300 SAM systems has already been delivered to that country. When will the contract be completed? I cannot discuss this topic. I can only confirm that Rosoboronexport continues to honor its contracts.